I assume the whole post is an excerpt from Mathison’s book again, am I right? Regarding the rejection of wine, isn’t it also true that grape juice as we know it was only able to be produced and preserved as it is now first in the 1850s or so. I heard someone mention that Charles Welch (of Welch’s Grape Juice) was instrumental in the movement to replace communion wine with grape juice. Have you heard anything along these lines? 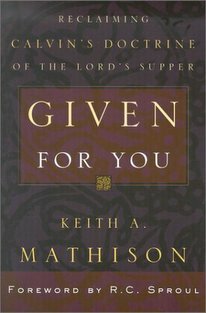 “I perceive thou art a prophet!” Yes, this continues my excerpt of Mathison’s book. My time was short yesterday, so I squeezed it in as quickly as I could, so I didn’t even bother removing the redundant titles (yet!). I can’t verify how early it was possible to preserve grape juice, but it certainly makes sense that non-alcoholic grape juice is going to have to be kept refrigerated. You’re definitely correct about THOMAS Welch’s part in the replacement of wine for grape juice. Thanks for linking me to your old post on wine. It really helped me get a sense of actually looking at wine as a source of joy, rather than an evil to be suspected. Whew! One less thing to worry about! Good Stuff! Nothing like capitalism to effect one’s orthopraxy. Thanks for the links, I was already researching this issue on my own and came across the Welches company history doc. I just did a post on this, having come up with much supporting documentation. I did use your other link, hope you don’t mind.